Fleas are nasty little pests that can populate your home at lighting speed. Two fleas can reproduce so quickly that in just a month you could have up to 250,000 of their descendants in your home. Before you know it, you could face an infestation – all because of one or two fleas that made their way in via your pet. Looking for ways to prevent a flea infestation in your home? Follow these helpful tips. Tip #1: Use a Flea Treatment Once a Month. If you use a topical or oral flea treatment on your pet once a month, you substantially reduce your odds of a flea invasion. Flea treatments from Advantage, Frontline, or Program are popular and can kill fleas on your pet within hours. These products are insect growth regulators, which means that they will stop the development and growth of fleas. If you have a puppy or kitten, find out from your veterinarian first if these flea-prevention methods are considered safe for young animals. Tip #2: Wash Bedding Regularly. If you wash your pet’s bedding in hot water on a weekly basis, you will reduce your chances of having a family of fleas settle in. Tip #3: Keep Your Home Clean. If you sweep, mop, and vacuum on a regular basis, you will help control the flea population significantly – especially if you live in a home with carpet. Place the vacuum bag in a plastic bag so the fleas cannot escape when you go to throw it away. If you allow your pets on your bed or couch, be sure you wash or vacuum these areas regularly. Tip #4: Wash Your Pet Regularly. Fleas love to make homes in the fur of dirty / ungroomed pets. Make sure you wash your furry friend frequently to keep fleas out of their fur. After you wash your pet, wait a day before applying topical flea treatment. Tip #5: Use Friendly Bugs. Friendly bugs, called beneficial nematodes, can eat flea larvae and can be sprayed onto the outside area of your yard every 6 to 8 weeks. Doing so is an effective, organic way to stop fleas from returning to your home. 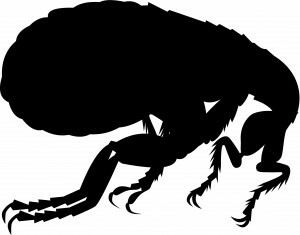 If fleas have been an issue for your home in the past, or if you are looking to prevent a first-time infestation, call our team at The Bug Man today. We have been helping families and businesses treat and prevent pest infestations in Portland and SW Washington for over 30 years, using environmentally-friendly methods. We look forward to meeting you!